Detail of the pattern, interior center. 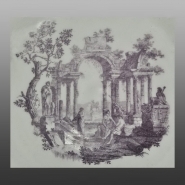 Worcester punch bowl with scenes of classical ruins in light purple. The scene shown on this side is known as Shepherd and Shepherdess (reference; Cook, Cyril. The life and work of Robert Hancock, item 169). 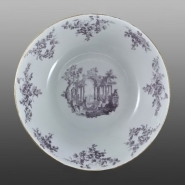 At 11 inches, this bowl it was about the maximum size that Worcester could fire successfully at the time. Note that this bowl was decorated even though it noticeably slumped in the kiln and is out of round.